Grant William, born at 9:06pm on June 30. 7lbs, 12.3oz and 19in long. We arrived at the hospital at 8:45pm, after I labored at home all day. We maybe waited a little long to come in, but it worked out fine. His birth was unmedicated, because of the timing, but I would have taken literally any drug they offered (they did not offer). He was also born in caul – his bag of waters wasn’t ruptured – which is pretty special. He did perfectly on the apgar, and took to breastfeeding like a pro. As with the twins, I had no tearing and needed no stitches (the moms out there know what I’m talking about), which is a very nice bonus. He is very musical, with lots of whistles and chirps already. Bob did an amazing job supporting me, even as I screamed in the wheelchair through the entire hospital and tried to squeeze his hand off. We are great, and we are complete. I am looking forward to the twins meeting Grant in the morning! Born in the caul! What magical powers will he have?? Glad to hear everything went well for everyone. Welcome Grant! Well done, Supermom!!! Thanks! It was SO hard! Awesome! Does this mean he was sightly early and ever so happy? What a good start. Not really early at all, but definitely happy! Congrats Zandy! Grant looks adorable. I’m very glad to hear everything went well. He’s so cute, and smiling already! Congrats to you and Bob, and to the new big brother & big sister! Thanks! I sure think so! 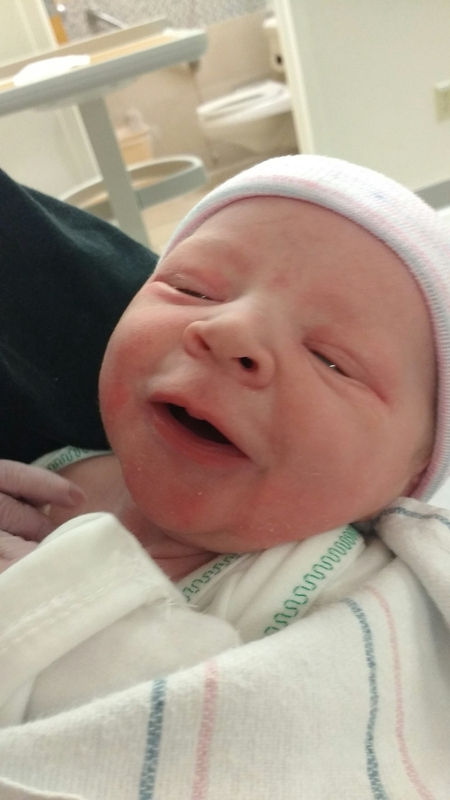 Welcome, little Grant! And congrats to all you Rings! Beautiful family!